recently, we noticed a plant growing in a random part of our back yard. 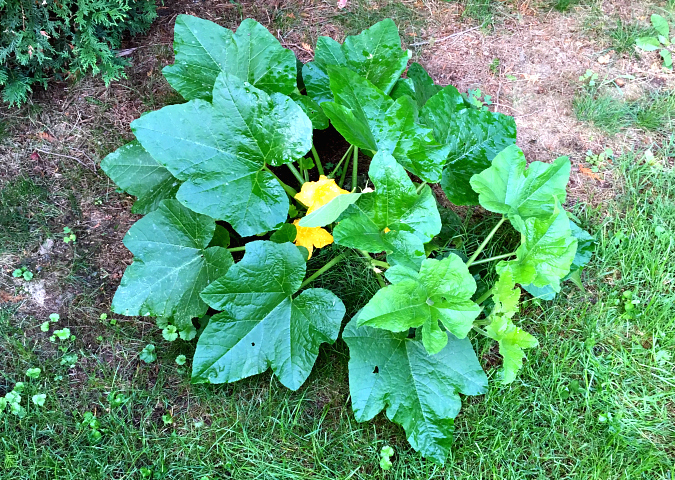 a few leaves popped up out of nowhere and we initially thought that it was a weed, but as it continued to grow we realized it looked a bit like a squash plant. it just kept growing and now it looks like a pumpkin plant! we certainly didn't plant any pumpkin seeds there, so we're starting to think that they may have been deposited there by an animal. regardless, it's growing and growing and growing! ryan snapped a picture of it on his phone last week and since then, a bunch of little flowers have bloomed on it. maybe we'll have a little pumpkin by halloween?! even though this week was a short work week due to the labor day holiday, it was a crazy and stressful one at work. i'm grateful that it's friday and that it's the weekend. classes at my dance studio start back up for the season bright and early tomorrow morning. i'm looking forward to getting back into the regular swing of the dance season after having a few weeks off from dance classes. You may be able to carve your own home-grown pumpkin for Halloween. Then make some delicious pumpkin goodies. Four-day weeks always seem to be longer than a five-day week. I have been off all week as to what day it was. Hope you can release all that stress in dance.